I am pleased to report that Grey is everywhere in 2014, a colour that is right at home here on Brit Decor. Why do I heart grey so much? It's such a sophisticated colour; it can be light or dark, warm or cold, and makes a great base colour for decorating schemes. This is also the colour of choice for many interior stylists this year and so I thought we should take a look at how to get the best out of grey and make it work in our homes. Introduce oak or beech woods to your greys, like this stunning mid-twentieth century sideboard (no.3) and the simple frame (no.1). This will add instant warmth and texture and bring your scheme alive. Without the correct lighting, your greys will descend into shades of charcoal (which is fine if that's the look you are going for), if not, employ some bold lighting to lift the room. For this, white glossy pendants can look fab when set against a chalky grey, like no.2 above. Because greys tend to sit in neutral colour scheme territory, don't be afraid to add some splashes of bolder brights. 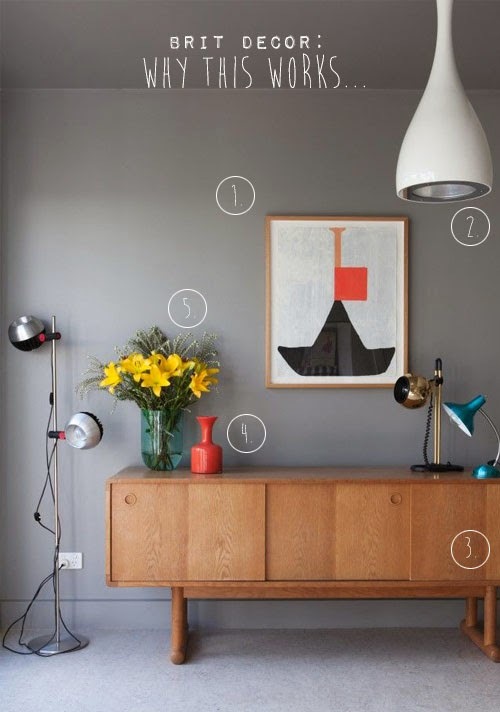 Vivid reds and oranges can work brilliantly with grey so perhaps try creating some accent colouring such as the vintage-look ceramic vase (no.4) and cleverly link this with a wall print or vibrant textiles. We know that Pantone's freesia yellow is also making headlines in 2014 and this is another fantastic choice to sit alongside a grey scheme, just look how fresh and uplifting the bright yellow arrangement of lilies (no.5) like a ray of sunshine! I also had great fun pulling together some of these exciting new shopping picks, below; all spot on for creating the perfect on-trend grey palette. Starting with this elegant Concrete emulsion from the wonderful Mini Moderns (no.7) as the perfect foundation for today's palette. 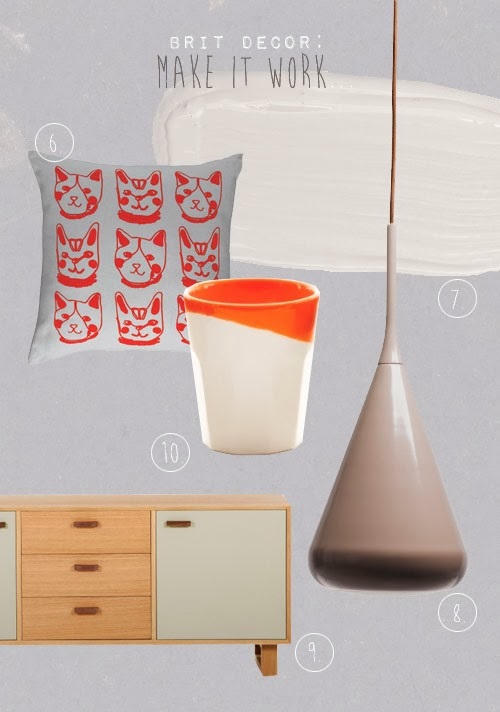 As the owner of two adorable cats, or I should say, being owned by two mischievous monsters, I instantly fell for Habitat's new Sushi cat print cushion (no.6), which works in incredibly well with the beautiful dipped-look earthenware cappuccino tumbler from Pedlars (no.10). For an element of understated elegance, I opted for this sand-coloured drop light pendant from Bo Concept (no.8), its slightly retro feel looks amazing in conjunction with made.com's Boundary sideboard and the subtle mix of grey against natural wood.